The small type on the cover says "America's Favorite Patriotic Music," and these 11 pieces are definitely that. Take "The Star-Spangled Banner," "Pledge of Allegiance/God Bless the USA" medley, "American Armed Forces Medley," "An American Hymn," "So Many Voices Sing America's Song" (sung with one of our favorite groups, Acoustix)," "George M. Cohan Medley," "A Tribute to World Peace," "America the Beautiful/Give Me Your Tired, Your Poor," "God Bless America" and "Battle Hymn of the Republic," and add the 160-strong, all-male multiple Gold Medal-winning Vocal Majority, and you've got a very powerful CD. 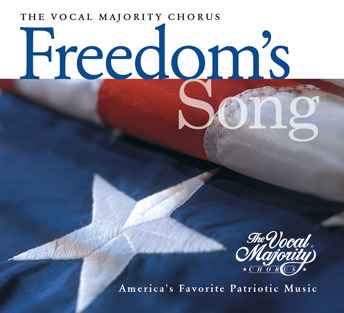 Directed by Jim Clancy, America's Premier Pops Chorus sings with the harmony, heart and love of country that these songs deserve.